The car-free, Alpine village of Valmorel is an ideal base for all levels of skier, particularly beginners and intermediates, and caters especially well for the family skier. The resort is part of Le Grand Domaine ski area and is connected to the neighbouring resorts of Longchamp and St Francois. Valmorel is set at a high altitude, yet it still offers some of the shortest transfer times to the nearest airport. 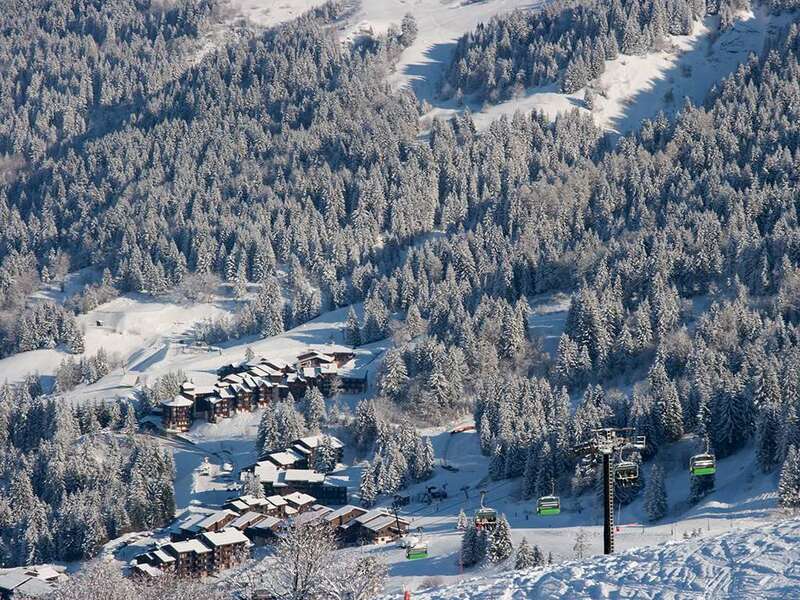 Valmorel is a picturesque car free resort set within the tree line above Albertville and Moutiers. This makes it the closest of the ‘high altitude Tarentaise’ resorts to any airport with shorter transfers. Architecture is second generation purpose built in traditional style complete with town square and church, quaint pedestrian zone bereft of high rise. The cobbled, traffic-free main street is where you will find many of the shops, bars and restaurants. Après ski venues range from quiet bars and restaurants, to busier venues complete with live music and a vibrant atmosphere. There are stunning views of the Mont Blanc range together with neighbouring Val Thorens and Les Menuires. Snow conditions in Valmorel are usually very similar to the nearby Three Valleys and visitors can enjoy views of the striking Mont Blanc mountain range in the distance. The resort is not however as popular as many of its neighbours, therefore you can expect to experience good quality food and drink at cheaper prices. Valmorel offers skiers, except the most advanced skiers, a good range of slopes served by a modern infrastructure of well linked lifts. The resort’s snowpark, boardercross and snowzones are excellent features and very popular with younger skiers and those seeking fun. For advanced skiers, the Col du Mottet area is challenging albeit limited in size. Beginners are extremely well catered for in the excellent local ski school, having their own reserved area of piste, and gentle tree-lined runs back down to the village making for picturesque enjoyment. We’ve had good feedback for the ski school and English is widely spoken here. There is plenty of opportunity for intermediate skiers, with many blue and red runs to occupy even the most mileage hungry of skiers. As well as the slopes around the village, there are some great opportunities for day long trips to St Francois and Longchamp, all on varied blues and reds. Valmorel’s pedestrianised main street is filled with restaurants, bars and shops suitable for the whole family. Restaurants include Le Petit Savoyard, Le Chalet du Mottet, Le Ski Roc, La Marmite and Le Perce Neige. Bars include Le Cade de la Gare, Le Jimbo Lolo, Hotel du Bourg and L’Albi nightclub which is open until 4am! Because Valmorel is not a world famous resort, premium prices do not apply. It offers good value and quality properties with a range from the very smart, slopeside Club Med Valmorel to basic, but quality, self-catered accommodation. An Iglu Ski favourite is the all-inclusive Club Med Valmorel, Chef de Village Gilles Lacrampe and all his terrific staff ensured service exceeded expectations on a trip in April 2016.